The 2013 World Series between the St. Louis Cardinals and the Boston Red Sox features two highly ranked and evenly matched teams. 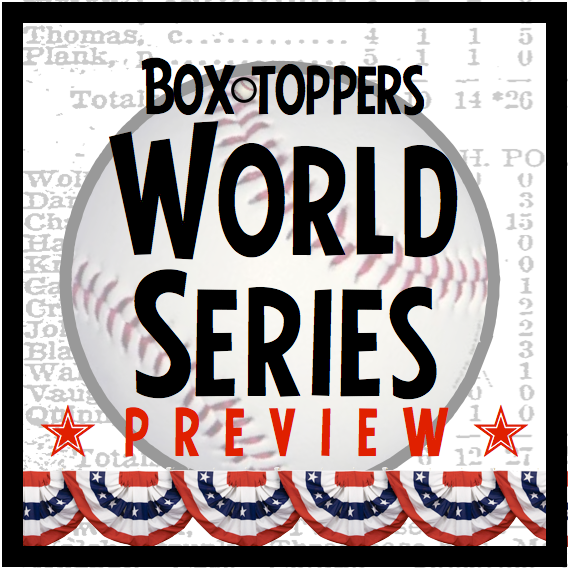 The Cardinals are ranked third in Box-Toppers Power Rankings with 122.4 Box-Toppers points. The Red Sox are close behind in fourth, with 121.7. So only 0.7 points separate them, which is less than one Box-Toppers Player of the Game honor (worth 1.0 point). Both teams also tied with the best regular-season winning percentage in baseball (.599, both with 97 wins). Both teams knocked off teams just ahead of them in Box-Toppers Power Rankings in their respective league championship series, both in six games. The Cardinals beat the second-ranked Dodgers (122.7 Box-Toppers points) and the Red Sox beat the top-ranked Tigers (123.4). The best-of-seven World Series begins Wednesday in Boston. Below are position-by-position match-ups of each player likely in the starting line-up for both teams (we have taken the liberty of inserting Cardinals first baseman Allen Craig into the designated hitter spot), along with the four most likely starting pitchers, the team's top closer and an extra pitcher. Also listed are each player's Box-Toppers points earned in 2013, along with their overall rank among players for the season. If you simply add together the Box-Toppers points of these 15 key players from each team, the Cardinals have 109 points and the Red Sox 96.2. If you compare them position-by-position, the Red Sox have more players with higher Box-Toppers points totals. The Red Sox have the edge in eight positions, the Cardinals in seven. The Red Sox batters tend to have better Box-Toppers points totals than Cardinals batters. Comparing position-by-position, the Red Sox batters beat Cardinals batters in Box-Toppers points by 6-3. However, the Cardinals tend to have superior pitching when it comes to Box-Toppers points totals, starting with their ace Adam Wainwright, who has 20.2 regular season Box-Toppers points and is ranked second among all players (Clayton Kershaw of the Dodgers ranks first). Three Cardinals pitchers rank in the top 20 in Box-Toppers points for the season—Wainwright, Lance Lynn (16.1 points, ranked 11th) and Shelby Miller (15.4 points, ranked 17th). Interestingly, Miller was not in the rotation for the NLCS, bumped in favor of rookie Michael Wacha, who though he has only 3.0 Box-Toppers points during the regular season, has earned Player of the Game honors for the Cardinals three times already this postseason (twice in the NLCS), more than any other player. The Red Sox top player in Box-Toppers rankings is pitcher Jon Lester with 12.7 Box-Toppers points, ranked 34th overall. Red Sox designated hitter David Ortiz has 12.4 Box-Toppers points and is ranked 36th overall, fifth among all AL batters. The Cardinals were the top-ranked team in Box-Toppers weekly power rankings reports from May 9 to July 25, 11 straight times. They remained top NL team for four more weeks until they were passed by the Dodgers Sept. 5 and remained the second-ranked NL team for the remainder of the season. The Red Sox were the top-ranked AL team in Box-Toppers points for seven weeks, from May 30 to July 14. They were top overall team in Power Rankings on Aug. 1, but fell back during August. In September through the end of the season, they were consistently the second-ranked AL team in Box-Toppers points, behind the Tigers. * Xander Bogaerts, who made his Major League debut Aug. 20, has yet to earn Box-Toppers Player of the Game honors and so has no Box-Toppers points. Players do not appear in Box-Toppers player rankings until they have earned Player of the Game honors at least once in their career. Bogaerts is expected to start in place of Will Middlebrooks, who earned 1.0 Box-Toppers point and is ranked 573rd.